Turkey is a vast country with many contrasts. Due to its geography and varying climatic conditions, the Anatolian land mass has witnessed a mass migration of diverse cultures through the course of history and became home to countless civilizations. Since the beginning of Turkey’s tourism, much has been said of Istanbul and Ephesus and yet, Turkey has much, much more to offer. Since the last ten years, we have had an incredible amount of requests from our guests who have been to Turkey several times but wanted to visit the most remote, lesser-known and culturally diverse corners of the country. It was technically impossible to cover almost all of Turkey and travel from one hidden gem to another due to the long distances. With the change in infrastructure across Turkey came the accessibility to numerous airports and accommodations in remote corners of the country. When designing our special Private Jet programs, our main focus was to give a full Turkey experience in the most comfortable way not only to cover different layers of countless civilizations but also of the living cultures in each area with their own distinct identity. 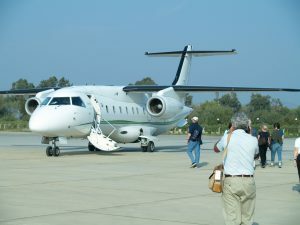 Our unique programs with insider Access opportunities are designed to give a full Turkey experience with excellent comfort both on land in air maximizing your time to savor a more in-depth experience. Please contact us for detailed itineraries either for Turkey only or Turkey-Georgia-Armenia and / or Black Sea by private jet programs, which include seven countries.